More worrying for many are concerns about permanent long-term damage to trade, with recent figures showing a rise in Afghanistan's trade with Iran and a corresponding decline in business with Pakistan. "Pakistan-Afghanistan trade has dropped significantly in the last 1½ years because of bilateral tension," said Motiwala, who estimated that there had been a 40 percent decline in recent years. So why has Pakistan taken the draconian measure of shutting down the entire border with Afghanistan? It's possible they're trying to pressure not only Kabul but also Washington and other NATO capitals, which have been making loud noises of late about Pakistan's continuing financing of terrorist organizations. PESHAWAR: The local business community has pointed out that the closure of Torkham border for the last nine days is causing heavy financial loss to it as export bound perishable goods have been stranded in containers on both sides of the border. Talking to Dawn here on Sunday, Senior Vice President Pak-Afghan Joint Chamber of Commerce & Industry (PAJCCI), Zia-ul-Haq Sarhadi said that the perishable items included poultry, meat, vegetables, fresh fruits and juices, saying that exporters were unable to find any alternative solution to the problem. Hundreds of trucks loaded with containers of export goods, Nato supply and goods brought under transit trade were stranded on Peshawar-Torkham Highway and the transporters were waiting for opening of the border, he observed. Similarly, he said, the imports from Afghanistan including fresh, dry fruit and wool were also stranded on the Afghan side of border. Mr Sarhadi said the businessmen had extended full support the government for the security measures taken under the prevailing situation of the country, adding that the national security should be top priority of every citizen. “The security of Pakistan is very much dear to us and all other matters are not more important than the security and salvation of the country and for this purpose if military and security agencies take some steps we will fully stand by them,” he stated categorically. He said major portion of Pakistani exports enters into Afghanistan through Torkham and Chaman border crossings while Kharlachi (Kurram Agency), Angoor Adda (South Waziristan Agency) and Ghulam Khan (North Waziristan Agency) were the other trade routes with Afghanistan. But, for the last nine days all these crossings are closed and everything has come to a halt. Mr Sarhadi said that the United States had introduced the latest SKODA information system on the Afghan side of border at both Torkham and Chaman to facilitate the transporters by saving time in checking of goods. The system is directly linked with 122 countries of the world. The business community of the country, he said, was demanding the same system on Pakistan side too, which was being installed at the under-construction modern export terminal at Torkham. The volume of Pakistan’s export to Afghanistan which was US$2.5 billion a few years back had declined to US$1.5 billion as the transit trade was also being shifted to Bandar Abbass and Chabahar ports of Iran. Similarly, he said, hundreds of containers were also stranded at Karachi Port Trust (KPT), Port Qasim and other seaports of Pakistan where demurrages to the tune of millions of rupees was charged while the trucks loaded with goods were also demanding heavy charges. Furthermore, he said, three more ships loaded with hundreds of containers had docked at the Karachi Port. Pakistani officials were hoping for the Afghan president to attend Wednesday’s ECO summit and billboards displayed at the meeting included Ghani's picture along with other leaders. But the rise in tensions prompted Ghani to skip the event and so did the Afghan foreign minister, who Pakistani officials say had confirmed his participation days before the summit. ISLAMABAD — Landlocked Afghanistan has used a regional summit to call on Pakistan to reopen formal border crossings between the two countries, saying barriers on trade, transit and the movement of people defy stated objectives of promoting economic cooperation among participating nations. Islamabad, which hosted Wednesday’s summit of the 10-nation Economic Cooperation Organization, or ECO, sealed all of the border two weeks ago, alleging militants planned and executed recent terrorist attacks across the country from Afghan soil. Pakistani Prime Minister Nawaz Sharif chaired the meeting where the presidents of Iran and Turkey, as well as several Central Asian states, were also in attendance. Afghanistan’s ambassador to Pakistan, Hazrat Omer Zakhilwal, who represented his government at the conference, underscored the need for separating economics from politics to promote the ECO mission of regional connectivity for economic prosperity. “They [border crossings with Pakistan] have now been closed for about two weeks, causing enormous hardship to ordinary people and damage to traders on both sides. We cannot be for regional connectivity if at the same time we continue to implement barriers to trade, transit and movement of people between us,” he said. Pakistan's decision to close the border with Afghanistan was a largely symbolic act aimed at forcing its neighbor to take action against extremist groups blamed for fomenting cross-border terror attacks. It's a hard reality for the travelers and traders trapped for nearly two weeks on both sides of the dusty crossings at Torkham, Ghulam Khan and Chaman. "I have come from Kabul 12 days ago," he said. "I am sick and cannot eat. I have no medicines, too. I don't have money to pay for my stay at the hotel." Pakistan says it understands the pain but claims it had to act amid a rash of terror attacks around the country that killed over 150 people in just a few days. Islamic State and allied groups have claimed responsibility for those attacks and similar ones in Afghanistan — which Kabul blames on terrorists in safe havens in Pakistan — that seem aimed at destabilizing both countries' governments and driving them even further apart when they could be cooperating to fight a common enemy. "When so much is happening [terrorist attacks] here [in Pakistan] and there are indications that it has links there [Afghanistan], then you have to do such measures, so this was a temporary measure," said Sartaj Aziz, Pakistan's foreign affairs adviser. "I hope border crossings will be opened soon." While Pakistan also has launched a nationwide crackdown on extremists, the closed border crossings have become the face of its anti-terror efforts. Normally bustling with colorfully decorated trucks mixing with cars, carts and pedestrians, the crossings now sit empty, except for armed Pakistani troops. 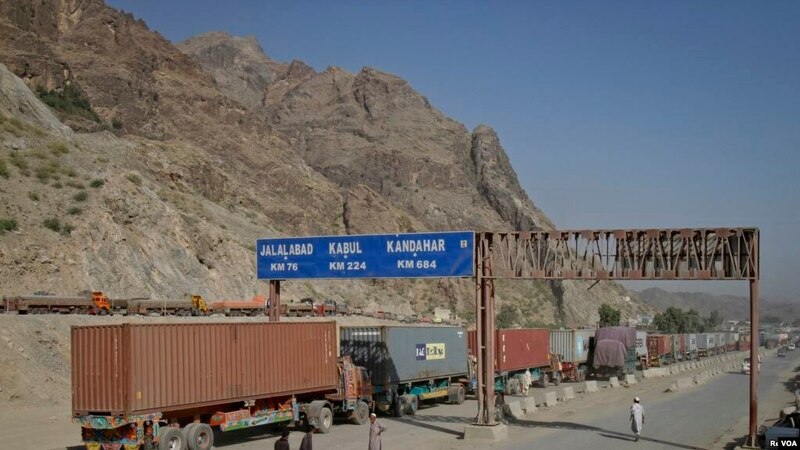 "The closures of these crossing points, which are heavily regulated with full checking arrangements on both sides, serve no purpose other than to inflict hardship on ordinary people and hurt trade and transit," said Omar Zakhilwal, Afghanistan's ambassador to Pakistan. Fatima Atif, a human rights activist, agrees. "Border closure will not serve the purpose, and it is not a long-term solution," Atif said. "We should regulate the border in an effective way and should have better ties with neighbors." Officials have estimated daily losses in trade at $3 million. "Hundreds of stranded goods trucks are loaded with fresh fruits, vegetables, poultry and other edible items, which are near to waste," said Zubair Motiwala, chairman and president of the Afghanistan-Pakistan Joint Chamber of Commerce and Industry. "We urge both governments that business and trade ties should be separated from political tensions." Truck driver Sayed Anwar said he had run out of his expense money, adding: "We have suffered heavy losses."